If you find yourself recreating the same macros, you can copy those macros to a special workbook called Personal.xlsb that is saved on your computer. Any macros that you store in your personal workbook become available to you whenever you start Excel on that same computer. This is different than Excel's default behavior, where a macro only works in the workbook that contains it. To create the personal workbook, you first need to create a macro and store it in the Personal Macro Workbook. Before you get started, make sure that the Developer tab is available in the ribbon in Excel. See Show the Developer tab for more information. 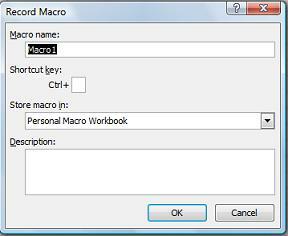 In the Record Macro dialog box, type a meaningful name for the macro in the Macro name box. Make sure you don’t use any spaces in the name. In the Store macro in box, select Personal Macro Workbook. On the Developer tab, in the Code group, click Stop Recording. A message appears that prompts you to save the changes that you made to the Personal Macro Workbook. Click Save to save the workbook. Any time you create a new macro and save it in your personal workbook or update any macros that it contains, you are prompted to save the personal workbook just as it did the first time you saved it. If you want to copy macros from the personal workbook to another workbook or vice versa, you can do so in the Visual Basic Editor (VBE). You can start the Visual Basic Editor in Excel by pressing ALT+F11. For more information about copying a macro from one workbook to another, see Copy a macro module to another workbook. If you have one, or just a few macros that you want to share with others, you can send them the workbook that contains them in an email. You can also make the workbook available on a shared network drive, or from a SharePoint Services library. On the Excel menu, click Preferences... > Ribbon & Toolbar. In the Customize the Ribbon category, in the Main Tabs list, select the Developer check box, and then click Save. To create the personal workbook, you first need to create a macro and store it in the Personal Macro Workbook. Save the changes, then close the workbook, and finally close Excel. Any time you create a new macro and save it in your personal workbook, or update any macros already in it, you'll be prompted to save the personal workbook. If you want to copy macros from your personal workbook to another workbook or vice versa, you can do so in the Visual Basic Editor (VBE). You can start the Visual Basic Editor in Excel by clicking Visual Basic in the Developer tab. For more information about copying a macro from one workbook to another, see Copy a macro module to another workbook. If you want to share your Personal.xlsb file with others, you can copy it to the Excel home folder on other computers. That folder for Mac is in the home folder at ~/Library/Containers/com.microsoft.Excel/Data/Library/Application Support/Microsoft/Roaming/Excel/.